A major manufacturer of hip and shoulder implants in the medical industry wanted to automate their abrasive blast cleaning procedure in order to improve the overall production process. 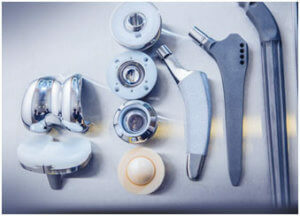 The goal of the medical manufacturer was to increase the production rate by at least five hundred (500) hip and shoulder implants per eight-hour shift as well as to improve part consistency and quality. The existing process consisted of manually blast cleaning the implants using a bank of four individual blast cabinets manned by four operators working two shifts a day. Due to the nature of parts being processed, the manufacturer was required to meet stringent FDA specifications with regard to part traceability and lot integrity. 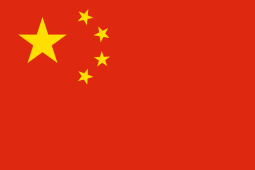 Unfortunately, with the current equipment and procedures in place, the manufacturer was experiencing inconsistent results and a high level of rejects as well as issues with frequent manpower turnover and training. Empire technical sales personnel and application engineers met with the manufacturer to evaluate the current process and determine their requirements. After careful analysis, Empire recommended, developed and installed a custom engineered automated in-line blast cleaning system designed specifically for processing the implants. 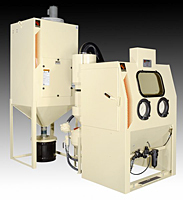 To improve productivity, the machine featured an automated conveyor system and two individual blast cabinets; one utilizing standard aluminum oxide media and the other using a proprietary formula developed by the manufacturer specifically for implants. 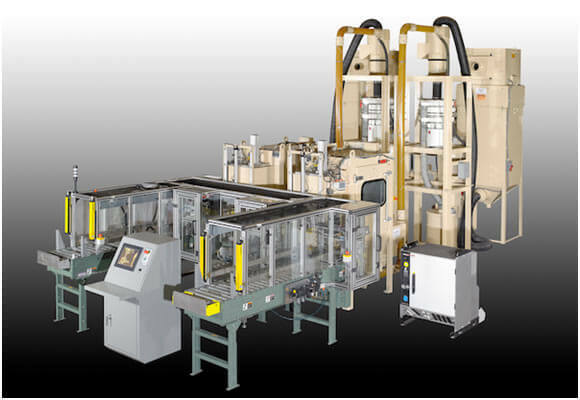 To further increase throughput, Empire designed a custom parts handling system that enabled the machine to hold up to ten fully loaded parts baskets with each individual basket capable of holding and transport ten parts at a time into the blast chambers. 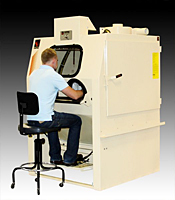 Each blast cabinet employed a six-axis robot with custom designed part gripper. 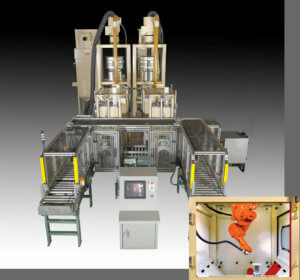 The robot arm was mounted inverted in each blast cabinet and was designed to grip the parts from the active baskets and present them to the stationary blast nozzle one at a time following a preprogrammed path, and then return the part to the basket. To help meet FDA requirements for part traceability and preserve lot integrity, Empire developed a system to enable the parts to be processed as a lot. The system would automatically scan each lot’s barcode that would then instruct the machine to set the parameters for that specific lot. 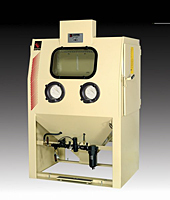 This included which blast cabinets to utilize (aluminum oxide, proprietary media or both), all of the preprogrammed paths for the robot motion and the setting of blast pressures. To further help meet FDA requlations, a machine vision system was used to verify that the part and the quantity in the basket was correct prior to entering the blast chamber. To ensure part consistency and quality the system incorporated fault sensors and a reporting system that would notify the operator if any part was found to be out of specification. 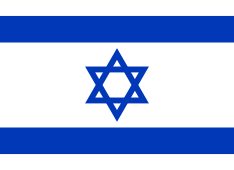 If so, the operator could immediately rerun the part to bring it within the appropriate parameters. 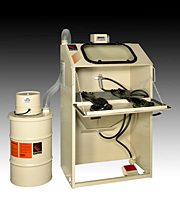 To eliminate the potential for cross-contamination of media, a blower was employed to blow-off any remaining aluminum oxide media from the parts as they travelled from the first cabinet to the second where the proprietary media was used. 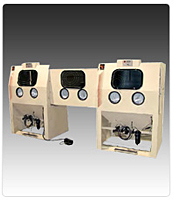 In addition, media reclaimers with screening assemblies made sure the media remained within the required size range so the highest quality finish could be achieved. Automatic profile verification, real time data acquisition and collection as well as power failure recovery was included in the system. The overall enclosure measured 30” wide x 50” deep x 86” high. 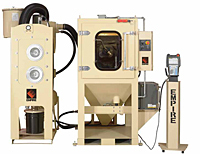 Empire was able to supply an automated abrasive blast cleaning system with precise robotic control of blast areas and material-handling features that not only increased productivity, but also assured repeatability — a major concern in this quality-intensive application that affected the manufacture of critical FDA regulated medical implants. The medical implant manufacturer was able to reduce manpower from four operators to one, a 75% reduction in labor, while improving finish quality and reducing the number of rejects. Overall, the Empire system was instrumental in helping the manufacturer reduce costs, maintain greater control over final product quality and meet regulatory requirements.